Sorry, but we have sold out of Behmor 1600 Coffee Roasters and Bundles. We expect to have more available in May but do not have a more exact date at this time. If you would like to notified when they are on their way to us please click the 'notify me' button. We will send you an email and, of course, there is no obligation. 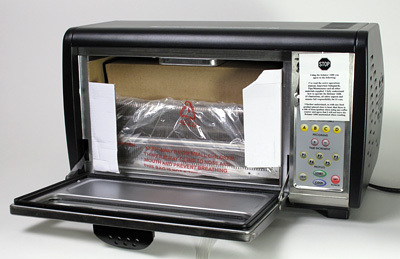 New and just in time for the holidays we are offering a Behmor 1600 Plus Roaster kit! In addition to the latest version roaster, 8lbs. 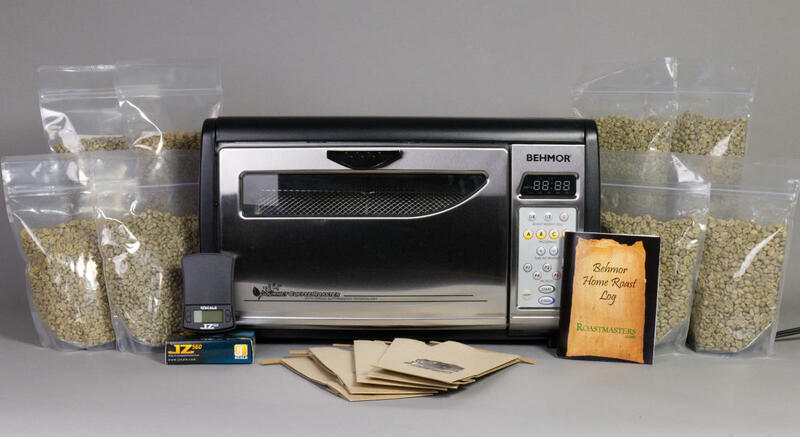 of green coffee, a coupon for more coffee and free ground shipping that normally come with your Behmor purchase, you can also get a pocket scale, roasting log and packaging to store your roasted coffee in! This is the ideal gift for someone who is looking to get into roasting, but does not know where to start. The Behmor offer we have year round can be found here. Hawaii, Alaska and Canada - $20 Shipping discount applies to any method. HI, AK use coupon code SHIPBEHM during checkout. Canada use SHIPBEHMC. Though small, the JZ560 scale has the same precision and functionality of larger scales. With a 560g (1.2lb) capacity, this scale will serve you well for all your Behmor roasts. While the cover of the scale doubles as a tray, we prefer to use a cup to hold our coffee beans - just remember to tare the scale before you pour in the beans! The scale will give you weight in grams, ounces, troy ounces and pennyweight. While it is recommended that you calibrate this scale prior to first use, it can be used without doing so. One of the selling points of the Behmor 1600 Plus is the roast consistancy it offers to the home coffee roaster. Using the same profile and program with the same coffee will yield the same results. For those who wish to experiment with their roasts and coffee, a roast log is a necessity. Our log makes note-taking easy, being designed specifically with the Behmor roaster user in mind. The booklet lets you record the weight, profile, program, start/end time, bean yellowing and first crack of any given roast, so you can easily repeat (or tweak) a favorite flavor profile. 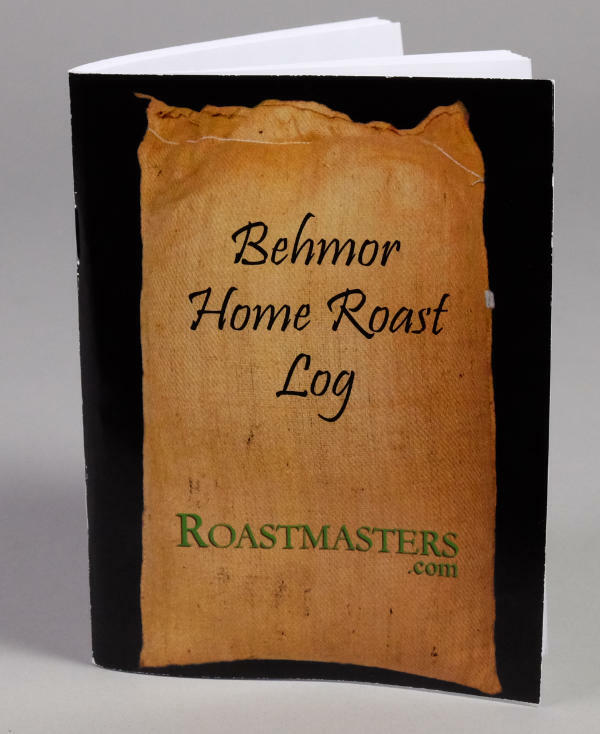 The front cover has a sample roast written out as a guide, and a Behmor 1600 Plus control panel picture is on the back cover for easy reference. The Behmor Plus ships with the latest Low Profile Chaff Tray. This chaff tray design significantly improves bean visibility,enhances airflow for improved cooling, as well as collecting chaff better than its predecessor. It represents Behmor's commitment to improve the roasting experience and results for users of our mutual home roasting customers. Latest Behmor low profile chaff tray (left)provides unobstructed view of roasting grid as compared to original. 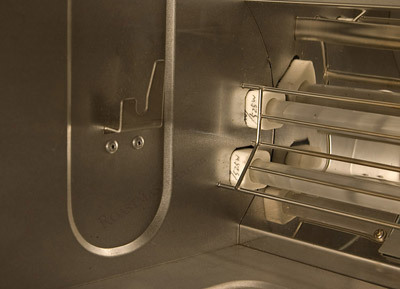 The tray has a series of vanes or louvers that open when in the "in use" position, meaning when inside the roaster. 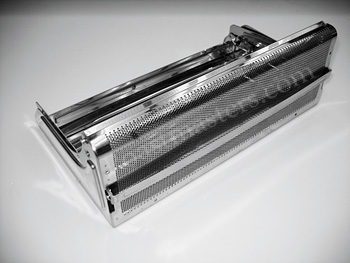 During roasting, the chaff that comes off the roasting coffee, is blown over and behind the louvers, trapping it. By doing so, the chance of chaff ignition is all but eliminated while airflow, for the roast itself, is improved. Air passes through the vanes but chaff is left behind. A clever solution and a real enhancement. 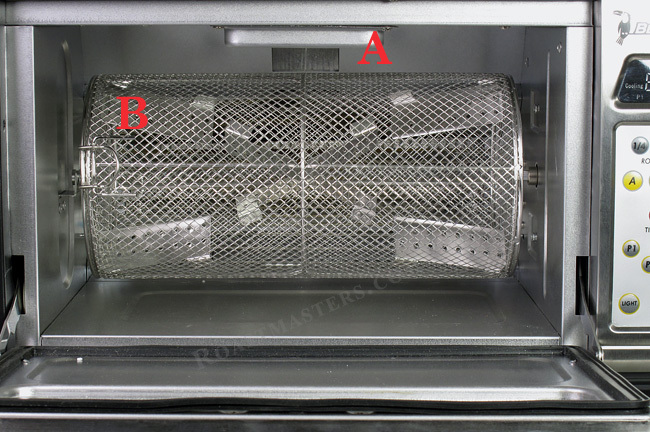 One of the original criticisms of the Behmor was the difficulty in seeing beans within the roasting chamber as they were partially blocked by the old style chaff tray. 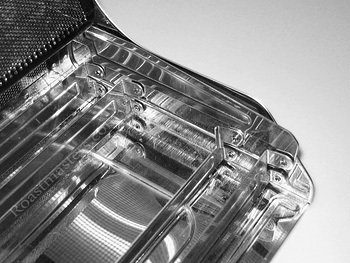 A workaround was developed where a piece of the mesh was cutout to allow better vision. Now, with the new low profile chaff tray, that workaround is obsolete. The new chaff tray is only half the height as its predecessor (see above), ending beneath the window in the door. The user now has an unobstructed view of the coffee roasting within! The louvers or vanes are shown in photo (left). On right, a rear view of the new chaff tray. The handle on the outside opens and closes the vanes. The most up-to-date versions of the Behmor 1600 Plus manual, warranty and safeguards can be downloaded by following these links. The Behmor 1600 Plus roasts 1/4, 1/2 or 1 pound of coffee. It has a choice of five profile programs. You cannot save program changes but some modifications can be made to roasts during a roast cycle to alter results. A terrific feature is the Behmor's smoke suppression system which is very effective at nearly eliminating roasting smoke and much of the associated aroma. This roaster, as the instructions will tell you, is not for doing dark roasts. The maximum roast darkness is 10 seconds beyond the second crack, which would be approximately a lightly spotted roast, a little beyond Full City, or what you might describe as a light Viennese Roast. If you wish to roast coffee darker than this you should look at our other choices in home roasters. But, if your needs are in the realm of lighter roasts, which are best for coffee's flavor nuances, the Behmor is a real contender. The Behmor 1600 Plus offers a lot of surprises an din many ways it is a wolf in sheep's clothing. Upon opening the shipping box the first impression was that the box itself was substantial. When we took the roaster out of the inner product packaging a few things stood out. Firstly, and everyone will say this,the roaster looks like a toaster oven or perhaps a microwave. I have to admit it's nicely made and it's obvious from the outset that a lot of detail and thought has gone into its finishes. The exterior, pull down door has brushed stainless facing out, with a knife shaped window a couple of inches tall and nearly the full width of the door. To the right of the door is the control panel and display. Originally, Behmors were packed with one cylinder an dafter some time users wanted one with smaller spacing so small or irregular shaped beans would not fall through the grid. Hence, the so-called small grid cylinder was developed and it eventually became the standard issue, replacing the original. In late December 2012 the third generation of grid was introduced. The latest grid which has a diagonal pattern has a simplified clasp on the end where coffee is loaded. It also has welds at each intersection which replace an unwelded basketweave pattern that had some small potential for spreading. The drum, of course, turns during roasting. It can only attach to the roaster housing and its motor one way. One side of the drum has a square peg that fits into a square hole; the other side is rounded and slips into a receiving collar once the square end is in place. You are to lift up on the left side collared end and, moving the drum to the left, it should withdraw from the square hole. With the drum out the interior is clean and surrounded by clean, aluminum coated steel surfaces. At the rear of the roaster are its heating elements, two 525-watt glass-heating elements for a total of 1050watts, more than other home roasters. This is one reason the Behmor is capable of roasting up to a pound. At the top of the interior is heated exhaust, which is responsible for removing smoke and some roasting odor. The interior is lit and the light can be turned on after the start of a roast with a button on the control panel; the light goes out after the cooling cycle has ended unless you want to turn it off sooner. Drum fits into square hole on right and into hook left. This roaster was designed to appeal to a broad range of consumers, meaning that it had to be simple enough to be a home appliance for anyone interested in home roasting without their full immersion in coffee knowledge and roasting technique; but, it also needed to have some of the bells, whistles and controls for the experienced or tech-savvy enthusiast - a tall order and likely an impossible one. The Behmor 1600 Plus adds optional manual controls and readouts that were missing from the previous model. Also, to increase the safety of home roasting, Behmor has added an blinking alert at 75% into the roast that verifies you are in attendance and paying attention to your roast. If you don't hit the start button within 30 seconds then the roast will end. This requires you stay by the roaster and watch its display rather than walk away and risk an issue. For a detailed overview of new features available in the Behmor Plus and its control panel please head here. Being a very quiet roaster it is easy to hear coffee go through first crack. 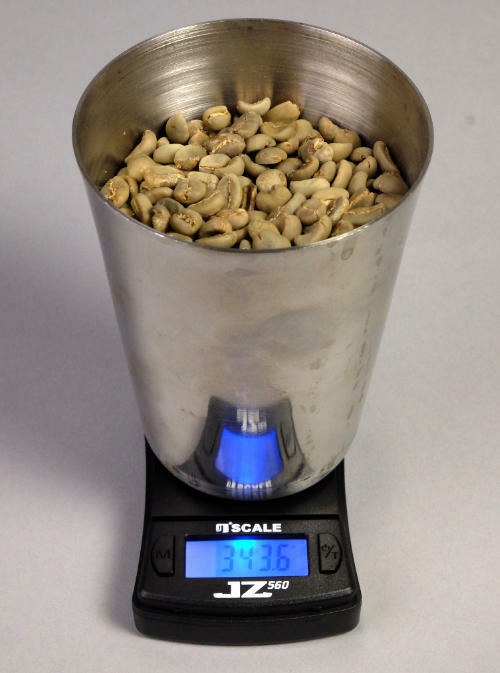 Behm has no doubt done laborious measurements to determine about how long it takes for coffee to go from first to second crack under various conditions, such as bean type, weight of coffee being roasted and selected profile. In their manual they direct you to use their "Rosetta Stone", a simple guide to how long it takes for coffee to go from first to second crack based on bean weight. Taking their advice in this regard is good idea, especially for new users, even those with prior roasting experience. 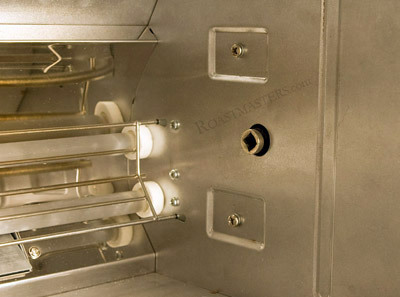 The roaster's interior 15 watt light provides enough visibility to see bean development; with the advent of the new, low profile chaff tray, you now have an unobstructed view, a real improvement over the taller, original tray. You will get the hang of roasting on the Behmor quickly. You will also find that the profiles built in to the Behmor are very close to what you will likely seek in finished roasts and highly repeatable. This roaster's ability to repeat results is one of its strengths. Profiles - As previously mentioned there are five pre-set roasting profiles. Joe Behm, inventor of the Behmor, is not a coffee roaster himself by trade. But, he had valuable input and advice from some experienced industry insiders in developing these profiles. The instructions provided suggest which profile to use for a particular type of bean which they classify as:hard, soft or island. Further, there are specific instructions about roasting 1/4, 1/2, or 1 pound of coffee for each of the profiles. Weight of the coffee being roasted increases roast time, with full pounds reaching more than twenty minutes. This may be of concern to some, but coffee can be roasted for extended times as long as it is not baking or causing beans to chip. Time increment - which are really time adjustments. Pressing the + button increases roast time in 15 second increments up to the maximum allowed for each profile and weight combination; the - button decreases roast time in 10 second increments. Profiles - variable methods to achieve different taste elements from any given coffee. Other buttons - Start,Off, Light and Cool are self-explanatory. Cool begins the cooling cycle immediately. To do a roast choose a profile and select the appropriate weight of coffee to be roasted (1/4, 1/2, or 1 pound). Once those decisions have been made you would press a series of buttons to start a roast. For example, if you wanted to roast a half pound of hard bean Guatemala at Profile 2, you would press these buttons: 1/2, P2, B,Start. The first button selects the weight, the second the profile, the third, B, sets a time adjustment, in this case 13 minutes, and finally,you press the Start button to begin the roast. 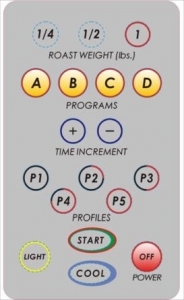 Shown below are the initial start times associated with each weight and program buttons. These can be further adjusted with the plus and minus time increment buttons up to the maximum allowed for each profile and weight combination. Important: We observed no hot spots, tipping or chipping of the beans during any roast cycles. Beans roasted uniformly. The drum's design, which has several paddle sand vee shapes, provides for ample mixing and movement during roasting.Also of significance, coffee is not roasting in a smoky environment soothe roasted beans have a cleaner, brighter taste. Many commercial roasters cannot lay claim to this, not to mention home roasters. P1 - Basically ramps right on up to 100% power and keeps that level for 100% of the roast time, producing the quickest roast. Notation: 100/100. P2 - Like P1 ramps at100% for the first 60% of the roasting time, then drops to 70% power for the next 30% of time. Full power for remainder of roast. Notation:100/60, 70/30, 100/10. P3 - A more gradual ramp-up. During the first 20% of time roasts at 70% power; 80% power during next 35% of time; full power during remainder of roast. Notation: 70/20, 80/35, 100/45. P4 - A variation on P3.During the first 30% of time roasts at 70% power; 85% power during next30% of time; full power during remainder of roast. Notation: 70/30,85/30, 100/40. P5 - The longest roast with the slowest, most gradual ramp-up. Roast time is broken into thirds with 70%, 80% and 95% power supplied in each segment respectively. Notation: 70/33, 80/33, 95/34. Here is the logic: P1 is the hottest, fastest roast, P5 the slowest and the others are variations in between. Behmor shows P1 and P2 as roasts for Hard Bean coffees;P3 for Soft Bean/low grown coffees; P4 for soft or espresso blends;and, P5 for Island coffees such as those from Hawaii, Jamaica, etc roasted to City/City+. Our own assessment and preference differs slightly for a number of coffees we have roasted. We find ourselves gravitating to P2 and P3 for many coffees. These profiles provide brightness plus body. The P5 profile is a sharp contrast to the others in that it produces roasts that are definitely skewed toward acidity; many of the mid tones and body are missing. Nonetheless, it is informative to seethe effects on the final output. While the roasting profiles cannot be altered or reprogrammed, it is possible to add or subtract time to roasts once they have started and effectively tweak them in this fashion. This roaster is unique in that you can continue to add increments up to the maximum allowed for each profile and weight combination (see chart below), though be cautioned, once past second crack you will begin to be inundated with smoke and this roaster has not been designed to produce dark roasts. The Hottop by contrast, allows the user to add 5thirty second Plus Times in total to the preset roast time. Maximum Roast Times - The roaster will not let you roast longer than the times shown below for each weight and profile as indicated. The Behmor 1600 proved to be the most popular home roaster on the market. The Plus model takes it to the next level making manual controls available in addition to fully automatic settings. In addition new readouts provide the temperatures of the exhaust channel or chamber wall. The bottom line is that it roasts coffee very well and does so with minimum of noise and smoke, making it well suited to home use. The price point puts it in reach of most consumers, filling a gap between the smaller roasters that sell for less than $200 and the larger Ottoman Genecafe roasters that sell for hundreds more. Also, the flexibility to roast batches up to a full pound yet as small as quarter pound is terrific. Profiles are effective. The appearance of the roaster, though not 'roaster-like' will feel at home in kitchens or other areas of the home. We strongly recommend that you restrict yourself to 1/4 pound roasts until you have gained real proficiency with the roaster before moving on to larger roasts. This will reduce failures and increase safety. Other important updates - updated, Maintenance, Troubleshooting and more. Look here for the most common issues. The Behmor 1600 Plus is designed for use in 120volt - 60hz environments ONLY. This roaster will not work in countries with any voltage and/or frequency differences with or without a power converter. Manufacturer's warranty is void outside of North America for roasters originating in the USA.